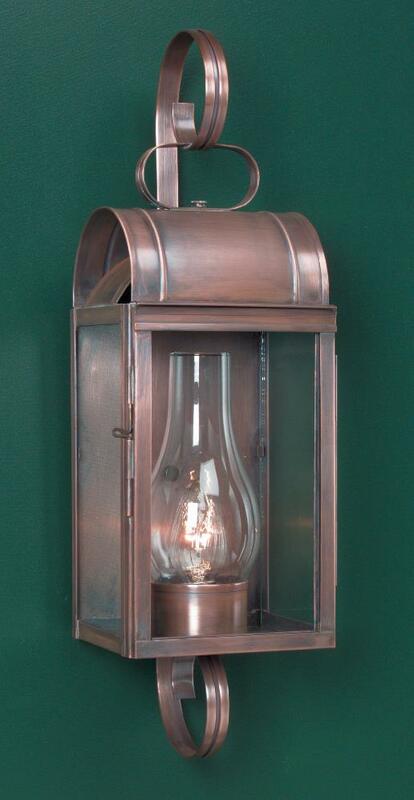 Cape Cod Colonial Wall Light, (model # W106) shown in antique copper. 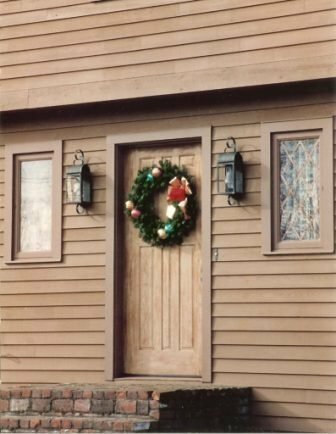 The design style with its graceful top and bottom scrolls are a perfect choice for this Cape Cod Early American antique reproduction home entry. At Lighting By Hammerworks we make Cape Cod Colonial Wall Lights completely by hand in the USA. Most importantly we use the same skilled techniques of hand bending and soldering the metal as our colonial forefathers. As a result of our attention to detail and quality craftsmanship you are guaranteed to receive a fine heirloom quality lantern. 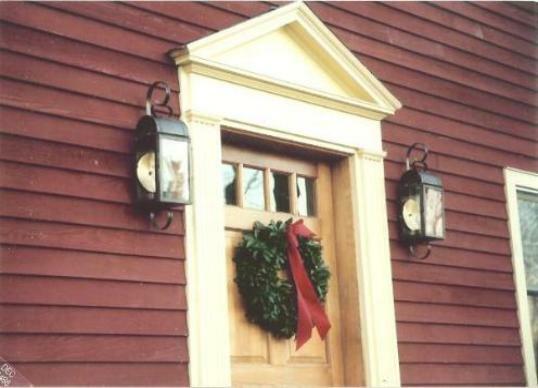 Therefore our colonial home wall lanterns will illuminate any entryway to your colonial home for years to come. In addition each of our Cape Cod Colonial Wall Lights is handcrafted with your choice of solid copper or brass. Hence this insures that you will consistently receive a solidly built wall light. 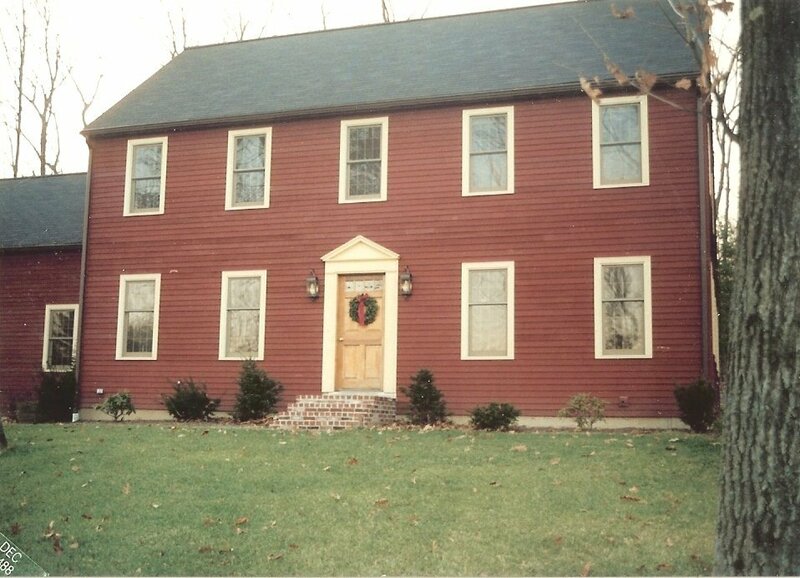 Most of all the attractive design adds aesthetic value to any colonial architectural home design. 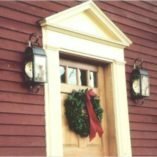 In addition to our collection of Cape Cod Colonial Wall Lights, we offer several matching New England Style post lanterns. Because the post lanterns range in size from small to large, it ensures that you will find one that coordinates well with your setting. Furthermore our Cape Cod Traditional Outdoor Lighting collection includes hanging lights in a variety of styles and sizes. Just as with our wall lights, you will receive the same high quality custom lighting. 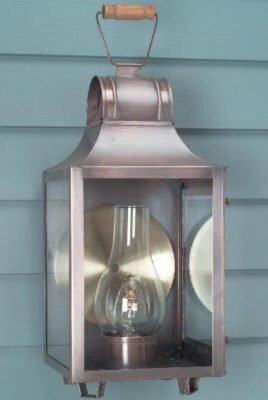 As a result it assures you of owning a classic combination of traditional Cape Cod outdoor lighting fixtures. 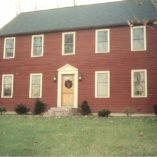 In conclusion Lighting By Hammerworks Cape Cod traditional outdoor wall lighting completes the architectural design of your home. Most of all the classic yet simple lines add aesthetic value to any traditional home. We offer this lighting collection in a wide variety of sizes and styles to meet your outdoor lighting needs. Also If you are unsure of which style & size to choose as appropriate for your home our knowledgeable sales associates will be happy to assist you in making the right decision. Finally, at Hammerworks we strive to create unmatched quality and craftsmanship one light at a time.